I really like where you've gone with the Wild. The color balance (something they've been swinging and missing on) is nice. 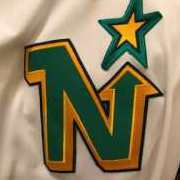 I'm not sure whether the stripe pattern is an homage to the North Stars, but it's not my favorite of their stripe patterns (then again, it's less obvious than something from the 1980s, which may be a good thing). I'd still say the third needs hem striping.